Developing a growing community like Willow Park can often feel like a conundrum. You want it to have all the benefits of a big city but still keep the small town feel and values of a local community. 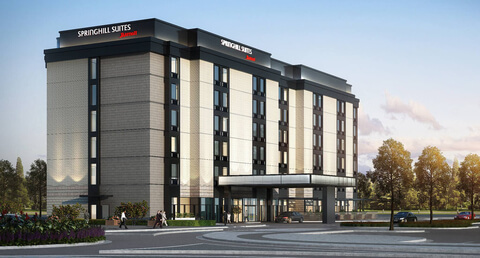 Within the vision of Willow Park North, Wilks Development is keeping this unique challenge in mind when it comes to expanding and developing the first hotel, a Springhill Suites by Marriott, in the area. As it stands today, the Willow Park area doesn’t have many large event spaces for individuals or businesses to rent out space for events like weddings, corporate events or other larger scale events. The new Springhill Suites, scheduled to open in early 2020, will have event space available for rent. The event space can be one large ballroom or divided up into smaller rooms, and also includes a large outdoor area that is part of the rental. “We host two events per year, bringing in more than 5,000 people with each event. The events attract local families as well as people who have never visited the area before. I’ve even had people tell me that they’d never been to the area before and after visiting the event and surrounding area, they decided to move their family here! Rather than having to crowd too many family members into your house during the holidays, you now have an alternative. And for good friends who live far away, you’ll be able to maximize their visits to town with a closer option for them to stay. This is also good news for residents of Aledo and surrounding areas whose children play soccer and other sports who tend to have to travel for tournaments. Previously, there was nowhere for out-of-town participants and their families to stay. Now, with the combination of restaurants, shops and the new Springhill Suites, this area now becomes an attractive venue to host those tournaments. New jobs and increased revenue for all the surrounding businesses due to an increase in visitors to the area all equal more financial resources for local residents and the city. Who doesn’t need to escape reality for a night or two every now and then? Whether it’s a girls’ night staycation or a couples’ romantic getaway, you can make the most of your time together by enjoying all of the offerings in Willow Park, including a brand new hotel to stay in. Take a look at the Springhill Suites website for a peek at the modern look and impressive amenities the new hotel promises to offer. Built with the balconies and pool overlooking the river, it promises to add to the beautifully unique setting of The Shops at Willow Park.